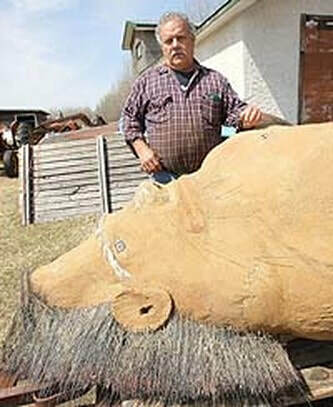 Manitoba man carves statue - Sasquatch Canada contains current and authoritative information on sasquatch and other homins. Albert Klyne shows off the statue he made of the creature he says he spotted near his home in 2001. (Jason Halstead, Sun Media).Tilt your head, to see the proper configuration of the object he carved. He calls himself a sort of Dr. Frankenstein, but Albert Klyne isn’t worried about his creation coming to life. What concerns the 63-year-old, is whether his muse will come back now that his masterpiece is near complete. “It gave me creepy feelings while I was making it, like a guy creating Frankenstein or something,” said Klyne, who has almost finished a statue he calls Neandertal Man — a life-size replica of the giant, caveman-like creature he claims to have encountered seven years ago on his acreage south of Portage la Prairie. Klyne said he caught a shadowy glimpse of the brute some 30 years ago and thinks he heard it crying from a distance when he was a boy. But he got his first clear look at the unidentified creature on April 5, 2001, when it followed a pack of turkeys that appeared to be injured out of some backyard brush accompanied by a mysterious black dog. The creature — which wore a loincloth and carried a hunting knife of sorts — wasn’t menacing in any way other than its size, Klyne said. Still, the encounter stuck in Klyne’s mind and so the previously inexperienced artist decided to memorialize it. The former tradesman constructed the statue’s massive frame from wire and wood, then filled it with stuffing and fibreglass insulation before shaping his smooth, muscular exterior from stucco. The sedentary Neandertal Man now stands nearly four metres tall, wears a deerskin loin cloth and — to match Klyne’s recollection — boasts chiselled abdominal muscles along with broom-bristle hair. “I think if he got on a weigh-scale, (the actual creature) would have been about 2,000 pounds,” said Klyne, who spent more than 3,000 hours and $800 to produce the approximately 400-pound statue. At the prompting of his wife and in fear of causing a public panic, Klyne kept his sighting silent for nearly a decade. But now that the statue is finally constructed, he plans to display it at area fairs in an attempt to find others who may have been impacted by its massive physique. by Julie Horbal, Winnipeg Sun, Thu, May 8, 2008.